Celebrate Hope from April 26 through May 6. 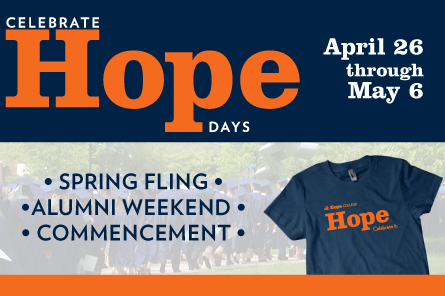 To celebrate the end of the school year, Spring Fling, Alumni Weekend, and Commencement, we’re announcing Celebrate Hope Days! Share and view pictures of you, your family, friends and even co-workers sporting orange and blue pride. And if you refer a student or make a $50 Hope Fund gift, we’ll send you a free Hope t-shirt! Hope College social psychologist David Myers, PhD is among the outstanding individuals with hearing loss honored by the 2013 Oticon Focus on People Awards, a national competition that recognizes individuals who are helping to eliminate negative stereotypes of what it means to have a hearing loss. The college's annual Honors Convocation was held Thursday (April 25) to recognize student scholarship, achievement and service.